Add necessary storage to your bedroom without taking up too much floor space with this handsome drawer chest. Four large drawers and two smaller drawers provide storage for anything from bulky sweaters to small accessories. 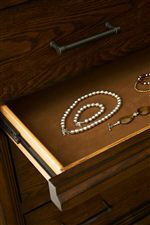 A hidden, felt-lined drawer offers space for delicate items like jewelry, neatly concealed for extra protection of your valuables, and cedar-lined bottom drawers offer aromatic appeal and protection for your clothing. 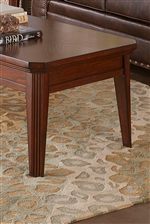 Crown molding at the top of the piece establishes a stately silhouette, while splayed legs offer a more casual style. 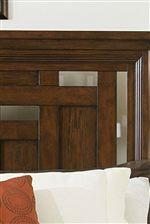 The Brown Oak finish looks warm and rustic, ensuring your bedroom radiates welcoming tones for a natural, relaxed atmosphere. The Estes Park 6 Drawer Chest with Splayed Legs by Broyhill Furniture at AHFA in the area. Product availability may vary. Contact us for the most current availability on this product.